Google’s increasingly refined search algorithms have led to a paradigm shift in the world of SEO, where user experience has gradually become more and more important for websites that aim to rank well in Google’s organic search results. Traditional ranking factors are now slowly being supplemented by user signals that indicate visitor satisfaction. Building websites that satisfy users first and search engines second is nothing new. SEOs have long known that ranking a website is only the first step in reaching new customers through Google, and the catch phrase “start with the consumer” has become something of an SEO mantra. There is now a new sense of urgency to prioritize user experience – both for mobile and desktop user – and, to some degree, abandon traditional SEO practices. While some tactics still may be effective, such as building internal and external links, satisfying visitors now takes priority. So what is driving this shift in focus? It has perhaps been fueled by Google’s official stand against unsatisfactory, low quality pages appearing in their search results. In a series of announcements, the search giant has been vocal about its efforts to tackle the issue of websites ranking highly despite not satisfying visitors. 2011 saw the introduction of Google’s Panda update which aimed at rewarding high-quality websites and demoting low-quality ones, and in 2014 Google published a patent which stated that “searching users are often the best judges of relevance”. This was then followed by the release of Google’s Search Quality Rating Guidelines: a document used by Google’s Search Quality Raters to judge the quality of search results. This document asks raters to “think about how helpful and satisfying the result is for the mobile users”. Finally, Google have said that a mobile-first index may be introduced in 2018. While these examples highlight how Google sticks with its core mission – to serve users the best content possible – they are also a testament of Google’s reaction to changes in technology and how the company adapts to higher user demands. As a result of these developments, SEOs have been forced to produce better websites and to develop a good understanding of user experience. UX is, perhaps somewhat reluctantly, no longer ignored as there is a need to optimise for users first, and search engines second. Worth noting, though, is that Google’s mission has remained unchanged since its launch in the late 90s, so a likely driving force behind this change of mindset is, simply, that SEOs keep doing what works. In other words, if UX is rumoured to be a ranking factor, SEOs will try to optimise for it. And it does seem that, this time, Google walks the walk. A 2017 Google ranking factor study carried out by SEMRush produced results that seem to indicated that Google promotes websites with good “behaviour user signals” rather than those optimised for certain keywords. In this test, which included top 10 search results for 600,000 keywords, websites that ranked the best kept visitors longer on their websites and received a higher number of direct traffic than their competitors. These results illustrate Google’s attempt to rely more on user data and less on onpage factors and links. The idea that direct traffic can influence rankings does raise the bar to a whole new level because it means, in effect, that the way to better search performance hinges on improved user satisfaction. The question that follows is: How does one optimise for UX and SEO at the same time? One approach is by starting with those elements of the website where A/B tests are possible and results easily measured. Click Through Rate, or CTR, is the share of clicks a page gets from a given search result. A high CTR tells Google that a listed page looks relevant and inviting to users. Today, Google understands the content of webpages without relying on meta data, thus optimising for CTR equals optimising for more clicks. The emphasis now is on writing eye-catching and convincing ad copy that make users click. Titles and descriptions need, in addition to drive clicks, also reflect the content of their corresponding pages. While it is true that, in general, higher positions receive more clicks automatically, it is encouraging to see that optimising meta data can still make a difference in ranking performance. The aim with CTR optimisation is to make users happy from the first touch point, i.e., the click. Naturally, these numbers vary depending on industry, language, product, location, etc, but can act as a benchmark. Google Search Console provides reliable CTR data and can, together with its open API, be used for analysing performance over time and identify opportunities for improvements. A bounced user is a user who clicks on a search result in Google, lands on the corresponding page only to return to the search result shortly after. This does not always mean that the user is unsatisfied, which is why bounce rate is a metric that can be misleading. However, if the user then clicks on another page from the same search result and stays on that website, Google would likely interpret this as the former page being inferior to the latter in terms of relevancy and, thus, demote it. Bounce rate can be improved by offering users the chance to explore more content, or by incentivising a direct action such as downloading a product or subscribing to a list. Regardless of what users do from this point, the idea is making them stay on the website for as long as possible, which according to the SEMRush ranking factor study, leads to better rankings. A research conducted by eMarketer in May 2017, reported that 67% of users in the U.K used a smartphone when searching/browsing the internet. Those statistics, coupled with Google’s continuous dominance in Search across Europe, means that mobile optimisation must be a core part of any digital marketing strategy. As far as SEO is concerned, optimising for mobile is less about content tweaks and links as it is about improving the overall experience for users visiting the website using a smaller screen. User friendliness is perhaps subjective but there are some general assumptions to be made about what makes visiting a mobile version of a website a pleasant experience – a responsive website is merely the starting point. Things to avoid include pop-ups, Flash, and too small CTA buttons and navigational links. Aspects to improve include page speed, local optimisation, and optimising for rich snippets by implementing structured data. SEO has been declared dead every year for the last ten years. 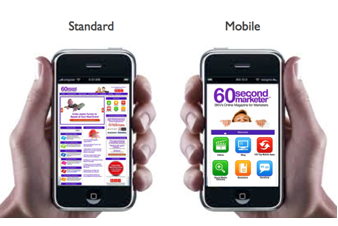 Does this shift of focus to user experience and mobile optimisation mean SEO is about to die yet again? Not likely. What we see is Google making changes that reflect what their users expect and SEOs are asked to follow suit. The future of SEO will likely continue this trend and SEOs must pay attention to whatever the next big thing in search is. It may be voice search, or hyper-personalised content, or even content produced in new formats. Time will tell. Whatever the case, SEOs will be there to optimise and satisfy search engines and user alike – simultaneously.